This unique three bedroom, two bathroom detached home is located at the end of a quiet residential cul-de-sac in the popular village of Tala. Village amenities and the newly renovated quaint square are close by. 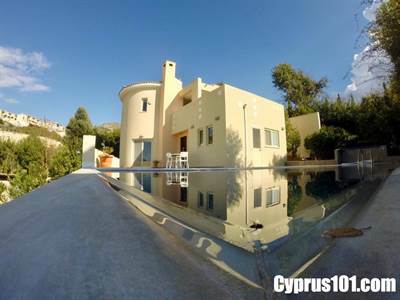 Paphos town, the International School and the coast are only a few minutes drive away. The lower level features an open plan living room with spacious lounge, formal dining space, fully fitted kitchen with breakfast bar and useful utility room. A hallway leads to two good size double bedrooms, both with modern fitted wardrobes and individual private verandas, plus a family sized bathroom with heated towel rails and stylish ceiling spotlights. A few steps lead from the dining area to the family size kitchen with modern fitted cupboards, granite worktops and quality appliances, including built-in oven with ceramic hob. The separate utility room provides further useful storage space. Sliding patio doors from the circular shaped lounge lead to a terrace overlooking the mature garden, filled with an array of established bushes and shrubs. Near the kitchen, a large outdoor veranda ideal for alfresco dining overlooks the stunning overflow swimming pool, stylish decking area and tiled sunbathing terrace. A wooden staircase leads up to a bright and airy, circular shaped master bedroom and en-suite occupying the entire upper level. A large, partially covered veranda houses a 6 seater jacuzzi – the perfect spot to relax and unwind whilst enjoying the fantastic sunsets and coastal views. At street level is a driveway for two cars, spacious double garage with remote controlled electric door and separate generous size storage room. An integral door enables direct access into the property via a staircase. For those looking for an impressive permanent residence or holiday home in a quiet residential area near to all the amenities, this property is highly suitable. There are full title deeds.